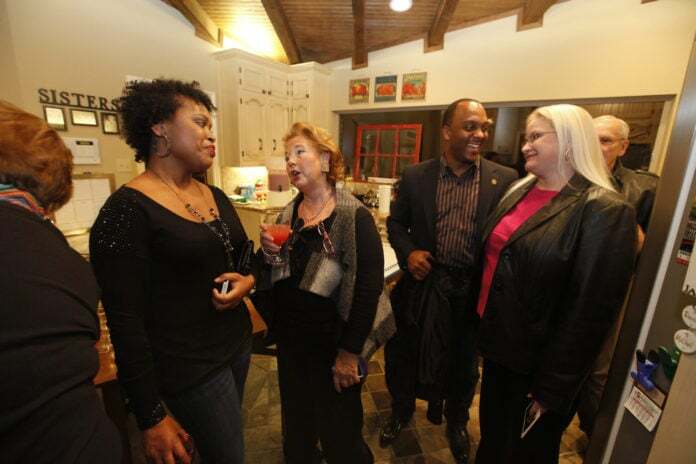 In this 2013 file photo Mayor Marcus Knight enjoys refreshments at the Lancaster's Visitors Center and State Auxiliary Museum prior to the tour. LANCASTER—The Holiday Homes Tour began as a fundraiser for Christmas decor in the aftermath of the 1994 Lancaster tornado. Ten years later, the tour of homes has become a much anticipated city tradition. Rebuilding the city was a slow process after the 1/2 mile wide tornado ripped through the city. The carnage was widespread. The historic town square, 233 homes and 58 businesses were destroyed. More than 200 homes and 2 schools suffered heavy damage. Finally, most horrific of all the category F4 twister took the lives of three Lancaster residents and left 48 injured. With municipal infrastructure a top priority, there were little to no funds in subsequent years for holiday decor. 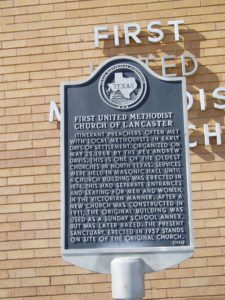 That’s when concerned citizens formed the Lancaster Heritage Park Foundation, which now organizes similar events throughout the year. 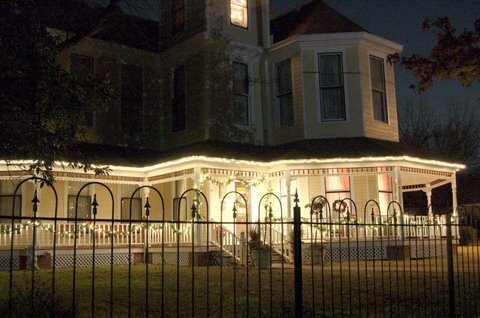 This American Victorian style home was the Preview Party Host during the 2009 tour. There are different homes on the tour each year. At each stop there is a docket presenting interesting facts about the structure. Tour participants share not only innovative decor, but family holiday traditions. Over the years, homes located in the city or nearby, have been of all ages, makes and models. Mazoch even recalled a year when a homeowner did not have interior decorations. 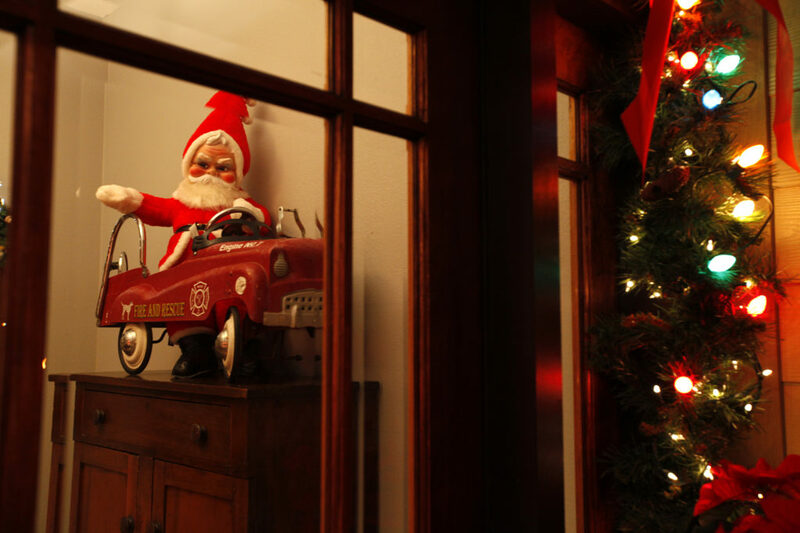 Tour participants share not only innovative decor, but family holiday traditions. About 125 guests attend the tour each year. Stops include Heritage Park, Community Park and a nativity scene at First United Methodist Church of Lancaster. First United Methodist Church displays a creche during the Christmas season. Located across from the historic town square, this year the church has added shepherds to the nativity scene. This year’s tour begins at the Lancaster’s Visitors Center December 3 at 6 p.m. A bus will transport guests to their first stop on the tour, a 13-acre ranch. Upon return guests will be able to drive themselves to three additional homes along the route. Finally, ending at the Dessert Party home for the “famous coffees and chocolates.”. Tickets are available at The Tattered Jacket Bookstore in Lancaster’s Historic Town Square. The cost is $35 per reservation.